← You really got a hold on me . . . The crew and I take the scenic route into Ajo. It’s a sunny day, but awfully windy at our campsite. Hmmm, maybe it’s not as windy in town. 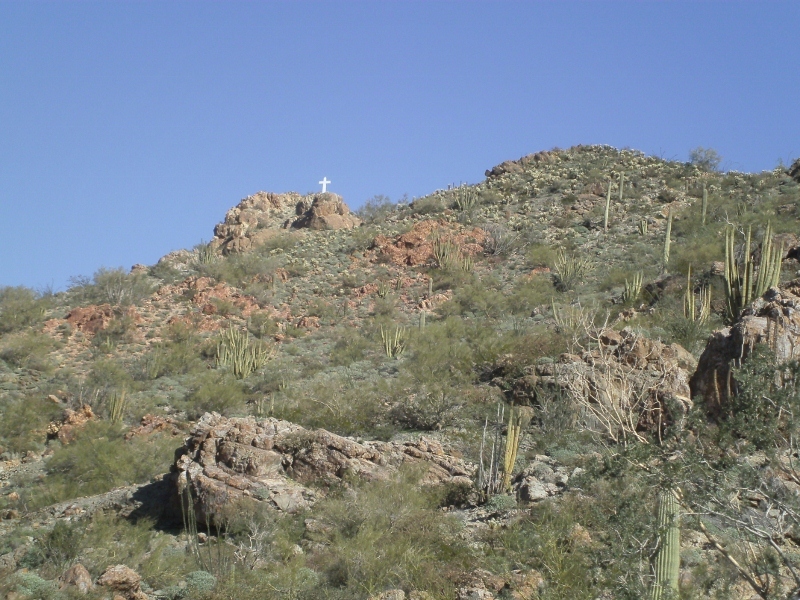 The dirt road takes us past the hill with the white cross on top. It overlooks the town and is visible from our campsite. I park the van at the town square. Bridget and Spike scramble down out of the PTV, excited to explore this new, strange place. Unfortunately the shops and offices form a U-shape that creates a vortex of wind. We try to enjoy strolling under the covered walkway around the perimeter. I find the library and the post office are along the plaza. A shop of Mexican imports has its door open. There’s a small display outside. I wonder how that Mexican blanket would look on the bed at home. The colors are so pretty. Sure would liven up the decor. A wind gust blows my hat off. I chase it down. The crew gets confused. Bridget pulls in one direction; Spikey in another. Enough of this! We’ll come back another day. I hate wind! The crew always seems to fall asleep on the road back to camp. I guess there’s nothing to do but hunker down inside the Casita. I have my book to read. I’ll put on some soup and make a tuna fish sandwich for supper. My mind wanders to my sisters, one in Florida and the other in Mississippi. Here comes another Christmas with us so far apart. I wish we were together. Well, at least I got to see both of them last summer. 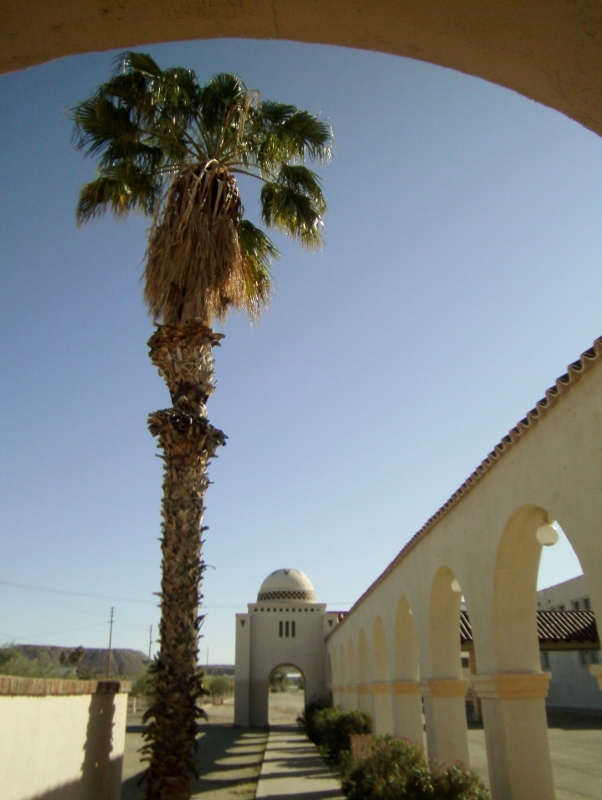 This entry was posted in Getting Ready To Go and tagged Ajo, Arizona, fulltiming, RV. Bookmark the permalink. I see reading your blog that being a nomad has its postives and negetives for sure. Family even in distance is never far from the heart. I am also alone my family not in the same city as I am. You are never alone as long as you have family and friends, no matter where they are. Keep your chin up!! Happy Holidays to all!! Sue, thanks once again for sharing your day with us. It is pretty cold here today, 35 degrees out right now. I got the Casita washed in town today at a self serve car wash. I emptied everything out of the cab of the truck and took it to a car wash where they cleaned it inside and out. Tonight the Bichon Brothers get baths and all of their bedding from the truck goes in the laundry. Wow! Would you mind sending some of your energy this way? The Bichon Brothers . . . that’s cute. It might be fun to plan to spend Christmas 2012 in either Mississippi or Florida. There are lots of neat things to see in both Mississippi and Florida. I’m sure there are some neat boondocking spots in their areas and the weather probably won’t be that much worse. I’ll get back to them somehow . . . Very windy here in Yuma today also. Good day to do laundry which is what we did !! When I got back the cover of the bike had blown off and was half way in the Lake !! Sure glad I was able to retrieve it in time. Gorgeous pics of the area. So, is this how it is in the winter here? I don’t know if I can take two or three months of wind. The sun is shining and the sky is blue. Now if the wind would stop . .. . I’m loving my catalytic heater right now! 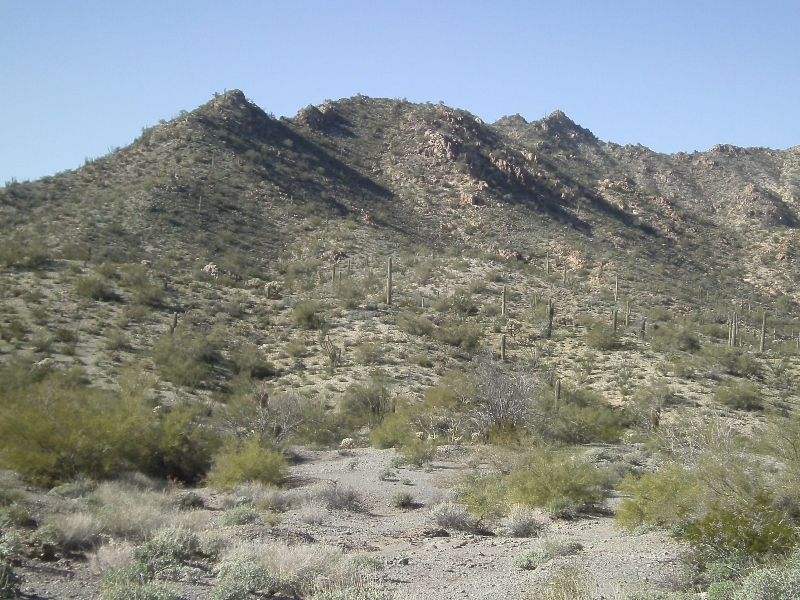 We enjoy the AZ desert as well, but after a while the incessant wind and red dust gets too us. It just never stops. Remember the old Clint Eastwood Spaghetti westerns? Clint knew how to deal with the wind & dust. You need a tall hat, a serape plus a scarf to cover your face during the dust storms. 🙂 then off you go while whistling the theme song from A Fistful of Dollars, or was it The Good, Bad & The Ugly?? They probably make scarfs to fit your two critters as well. Yeah, Clint knew how to take care of things. If this wind keeps up, I’m gonna LOOK like Clint Eastwood. Fortunately there’s only wind here. It’s too rocky for dust, at least this time of year. Thank you for the wish… still treasure our time together last summer. Love you and miss you. NANCY, I am sorry about the bear book too…but it did make for a great comment in my Kiddy Lit class at college. Love you, too, Pauline. We had fun, didn’t we. I don’t like the wind either and it does blow a lot here in AZ. But I noticed that it blows quite a bit more in Montana than it used to also. Maybe I’m just getting old. My sister and I get to spend Christmas together which is fun. But it’s can also be a really hard time. Hope the weather clears up and you have a peaceful and happy Christmas day with the fur pups. Thank you, Sandie. I hope you have a wonderful Christmas, too. hey Sue, do you or your sisters have webcams on your laptops (or phones)? Skype video is great to do every once in a while. When I was snowbirding last year and had been away from family for about a month, it was terrific to fire up the webcam and see everyone– I even walked outside with my laptop and showed off my campsite! If they don’t have webcams built in, they can buy them for around $30-40. Video chat does take up more bandwidth, so you wouldn’t want to try it every day, but once or twice a month should be doable without exceeding your cellular data cap. Hope you and the crew have a cozy Christmas and enjoy your beautiful desert views! We don’t have webcams, but we do appreciate being able to email. I sometimes think of the pioneers and how they had to wait for months for word from family, if they heard anything at all. You have a great Christmas! Have you looked at http://www.freecampgrounds.com or http://www.freecampsites.net ? Okay, you’ve got me confused. Are you billybob or HoboJoe? I didn’t know there was another Billy Bob or HoboJoe. This HoboJoe is in Hawaii and didn’t write that comment. The one and only Billy Bob is in Texas and he didn’t write it either. Just wanted to clear things up. I enjoy reading your blog. I’m happy you enjoy my blog. Have a great Christmas! I heard on the news that the wind in Calif. was terrible today. Blowing over semis. Guess you got some of the residual effects. They say that the pioneer women in Ks and Neb. would go crazy and run screaming through the fields after days of the wind howling. I can believe it. I can believe it, too. Thankfully, today looks calmer, although you never can tell. The weather is very changeable here. Funny how a few miles down the road there wasn’t any wind until about 7:15 tonite. Now I am not hearing it anymore. Stinkin MiFi just doesn’t stay on. My MiFi is tempermental, too. Very frustrating! Merry Christmas, JoJo! I can see the love you share with your sisters – from your blog and their comments. I have two sisters I am very close too so I understand how you feel. Thankfully mine live close by but even when we are apart we are close in heart. Sure hope that winds dies down soon. I am not fond of wind either. I’m glad that you have your sisters nearby. I can’t remember the last time the three of us were together for Christmas. Treat yourself to the colorful Mexican blankets! I can’t believe it, but the 4 I bought are still as bright and colorful as they were 25+ years ago when I bought them! They wash up well and I can’t believe how they well they have lasted! I use them every winter, they have been beach blankets, tent camping blankets… they have been well used. I bought 2 of the thicker heavy cotton one and 2 of the more colorful thinner blankets! They are just beginning to fray around the edges! Their bright colors always cheer me up! You got the wind, we got the snow… at least 5-8 inches out there now and still snowing! Supposed to snow all day! I’ll take some photos and post them later! Hooray…. a white Christmas !!!! Wish you could come for Christmas ham dinner !!!! Snow will prolly be all gone by Tuesday! What is with so much snow in Truth or Consequences! Last year you froze and this year, snow . . . Oh, that ham dinner sounds so good. The Mexican blankets would make the Casita more in tune with the locale, rather than my quilts . .. I didn’t even see the price, my hat blew off, and … well, you know the rest. Is Chuck as excited as you about having a white Christmas? Yep, Chuck (I) is(am) excited… last one was about 20 years ago in Pine Mtn, CA. We’ll put Geris TrailBlazer in 4WD and head to Grovies tonite for a RUEBEN!!!!!!! I just posted snow pictures on my blog, just in case you want to come back for a white Christmas with us! Sure looks like you are hunkered down and in no big hurry to go anywhere. Can’t blame you. I love the desert and it’s peacefulness. Right now I am still in Fernley, NV where I just finished working for Amazon this week. It was 4 degrees here last night so you can bet I am anxious to get into Quartzsite where I can enjoy some nice temps. I read about your Amazon adventure on your blog. (People, click on his name to read all about it.) Sounds like it was a lot of work, testing your endurance, yet a good deal for rvers ($$$), and the people are good to work for. Time to kick back . . . Happy Holidays Sue and Crew , your family and all the posters. Here in So. Oregon it’s been 15 to 20 at night and 45 to 50 day time the last few days. Sue I really love looking at your pictures and reading your stories. Thank you, Jay. Happy Holidays to you, too! Wind down here in Pahrump, NV was 50mph and it was 28 degrees the last few nights. Two weeks ago it had 80mph gusts. Today the opposite. Clear crisp skies, beautiful mountains all around, sun ablaze, and no wind at all. Can’t wait to get on the road again. I lived in Reno for 25 years, before Amazon got to Fernley, and Jim is right, that area of northern Nevada can get down right chilly. I hope the weather is still nice in Pahrump for Christmas. Enjoy the holiday! I hope you have a more peaceful day today. blessings from Anne and John, new Zealand.. Woo Hoo Sue…sun is shinning and the wind is just a breeze…temps to be in the 70’s by Thursday…hang in there…it’s gettin better!!! I can’t tell you enough how much pleasure reading your blog has brought me! Merry Christmas Sue n crew…looks like you’ll have some sun shine and calm weather! What a year this has been for you! Last Christmas, this was all still a dream. You could barely imagine what it would be like living in the desert SW, untethered from the grid that seems unwilling to let some of us go! I know we haven’t known each other very long, I just want you to know how grateful I am to have met you on your journey. Because of your words, your images, your blog, you are not alone this Christmas! We are all with you, stuffed in your Casita, celebrating with you and wishing you the Merriest Christmas ever and I, for one, can’t wait for your new year! Geri, Chuck and our Hound Herd, Scotty, DoogieBowser, & Radar! Merry Christmas indeed, Sue&crew. Thank-you for sharing your adventure, and yourself. Merry Christmas from Salina kansas. Hope you and the crew are staying warm. I sure enjoy reading your blog. My wife and I got up early to put the turkey in the oven and are now just waiting for the kids to wake up. Should be a nice sunny day today with snow on the ground and temps in the 40’s. Merry Christmas and happy new year. Merry Christmas from Hendersonville,TN. I wish you and your crew an ejoyable Christmas day filled with loving memories and anticipation for those waiting to be made! I love your reading about your ventures. Merry Christmas from cloudy Honduras. I had expected to lounge around the outdoor pool in my swimsuit this weekend, but I am instead in a light jacket. Guess Tegucigalpa didn’t hear that the rainy season is over. 🙂 I enjoy reading your blog, and hope your adventures in the new year continue to be the life you enjoy.